The Federal Liberal party is targeting environmental groups it claims may be using tax deductible donations to fund illegal activism. The Federal member for Bass, Andrew Nikolic, introduced a motion yesterday at the party's federal council meeting to strip eco-charities of the same rights permitted to other charities, including tax-deductable donations. The motion was unanimously endorsed. Mr Nikolic said taxpayers should not be subsidising the actions of 13 environmental groups who are allowed to receive tax-deductable donations. He believed some of the groups practice political activism. Continuing to burn fossil fuels at the current rate will lead to catastrophic climate change. The International Energy Agency recently warned that unless we act now, we could face warming of up to 6 degrees by the end of the century. We know we need to keep warming well below dangerous 2 degree levels, and the Climate Council tells us we have a total remaining global emission budget of around 600 billion tonnes if we are to do that. Climate change is the consequence of unchecked pollution. When carbon emissions caused by human activity enter the air they have dangerous effects on the environment, the economy, and our wellbeing. The Bob Brown Foundation. 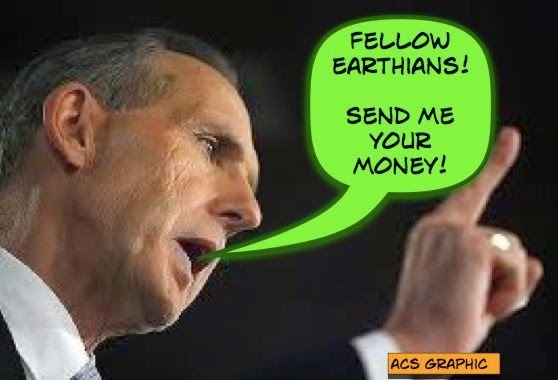 Remember Bob Brown: "An enviro-cop framing the big Green issues through an obscurist, metaphorical lens of little green men." political and social activists who learned to use green language to cloak agendas that had more to do with anticapitalism and antiglobalization than with science or ecology.